These nifty sharpeners have two compartments- one side is meant for use with graphite and charcoal pencils, while the other side is for color pencils. The yellow side has one hole that is standard pencil size; while the orange side has two holes- one that is standard size and one that is larger, for graphite sticks or larger sized pencils. (This way you do not get graphite and charcoal smudges on your colored pencil tips.) Of course, you can use both sides for whatever type of pencil you prefer! 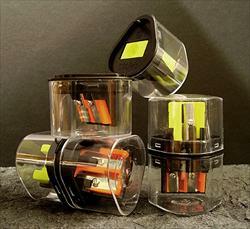 These sharpeners are made in Germany; with very sharp precision cut German sharpener blades. The blades stay sharp much longer than many other pencil sharpeners that we have tried. Compact and convenient, and just plain cool!